A high alert has been sounded in south Kashmir after nine kin of policemen have been abducted by militants. According to some sources, two more relatives of policemen are reportedly missing, taking the total number of abducted people to 11. The string of abductions is seen as militants' tactic to intimidate the police. Sources in south Kashmir said militants abducted Zubair Ahmad, son of a policeman from Arwani area of Kulgam district; Arif Ahmed, brother of a police officer from Arwani; Faizan Ahmad, son of a policeman from Kharpora, Kulgam; Sumar Ahmad Rather, son of a policeman from Yaripora, Kulgam; and Gowhar Ahmad, brother of a Deputy Superintendent of Police from Katapora, Kulgam. The five were abducted last evening. The identities of two other abductees are yet to be ascertained. Earlier, militants had abducted Nasir Ahmad, son of a policeman from Midoora Tral. On Wednesday, militants abducted Asif Ahmad, son of a local policeman Rafiq Ahmad Rather from Pinglish at Tral in Pulwama district. The abductions in Shopian, Pulwama and Kulgam come in the wake of houses of two Hizbul Mujahideen militant commanders being burned down on Wednesday. Houses of Naveed Mir of Nazneenpora and Shahjahan of Amshipora were set ablaze after militants killed four policemen in Shopian on Wednesday. The militants had fled with the weapons of the murdered cops. Following the cops' killing, the police had summoned father of senior Hizbul Mujahideen commander Riyaz Naikoo for questioning. Earlier, in an audio message, Naikoo had warned against those who intended to contest Panchayat polls. According to sources, Naikoo's father is still in police custody. The father of another senior Hizbul militant Latief Tiger is also in police custody after he was summoned for questioning. According to sources, top police officers held a meeting last night to discuss the situation. It was decided that an operation would be launched on Friday to locate the abducted persons. 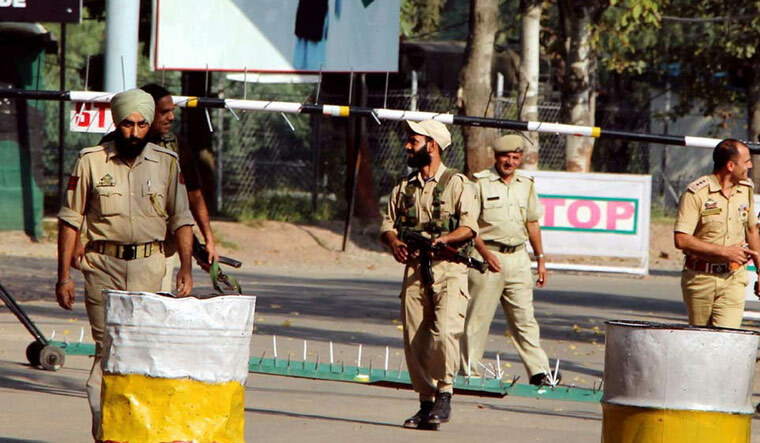 A senior police officer told THE WEEK that there were 21,000 families of policemen in south Kashmir and it was not possible to house them in baracks as in the case of other forces operating in Kashmir. The police have an "organic link" to the society and that cannot be severed, he said, adding that the police have handled the situation with a lot of care and have ensured no ''extra judicial activity''. Regarding the summoning of Naikoo's father, the officer said he was called for questioning because Naikoo has several hideouts. "It was a routine questioning and he is not in police custody," the officer said. When asked about incidents of vandalisation of militants' houses, the officer clarified that those acts were not carried out upon their instructions. "We never instruct anything like that. There are other forces working here," he said.